Moorings Homes: Stunning gated waterfront estate home plus its own "Field of Dreams". These two properties are visually combined though separately deeded creating one particularly spectacular and incredibly rare waterfront offering in the Moorings. Over 225' of linear water frontage, over 200' of depth, approximately 1 acre of park-like waterfront perfection. Two properties, one price. Multiple docks for multiple boats, personal watercraft, paddleboards & kayaks including 13,000 lb. platform boat lift area that is also perfect for fishing which is also true for 30' floating concrete boat dock / pier. Authentically special, no mandatory HOA's or monthly / quarterly HOA fees, no architectural review boards etc. . Moorings Resident's Beach Access considered by many to be one of the prettiest sections of beach in Naples nearby. Residence designed / built to last. This truly celebrates waterfront living in Naples - gentle winds blow as you sit in one of the swings hanging from the massive cascading Cuban Laurel tree along the waterfront - relax in your 50'+ pool as the sun is setting while the inland waterway and lights begin to twinkle. Unsurpassed waterfront value from Park Shore to Port Royal. Moorings Homes: Beautiful new custom home in The Moorings with southern exposure on pool! Spacious great-room plan with floor to ceiling Grabill Cabinetry in kitchen, service kitchen and laundry room. Master Wing includes: large master bathroom with two water closets, two master closets, and sitting area bedroom. Enjoy the outdoor living with over-sized pool deck that has sun all day, gas heated pool and spa, gas fireplace, outdoor BBQ grill and under-counter refrigerator and ice maker, electric screens & shutters and pool bath. Upgrades Include: Legno Bastone herringbone wood floor with border in Main Living Room, Foyer, Kitchen and 8-1/2" Wide plank through out bedrooms and den, Grabill Custom Cabinets, Sub-zero Integrated Refrigerator/Freezer and 48" Wolf Gas Cooktop, Sub-zero refrigerator drawers, stand-a-lone ice maker. Service Kitchen includes: Wolf Steam Oven, wall oven, warming drawer. Custom ceiling beam work, security system, central vac system, camera system, Cinema ceiling speakers and pre-wire for surround sound in great room, and control 4 lighting system in main living area and master suite. Private Mooring Beach available! Moorings Homes: Completed in 2019. Designed by Falconer Jones and built by Knauf Koenig. This exceptional one level home on a quiet non-thru street in the Moorings offers close proximity to pristine beaches, Venetian Village and Waterside Shops. Masterfully designed around a stunning pool and spa with no detail overlooked. Extensive millwork and Legno Bastone wide plank wood floors are complemented by hand selected marble/stone, Ruffino cabinetry throughout and Sub-Zero-Wolf appliances in the open kitchen and wet bar. Pantry kitchen includes a second refrigerator, dishwasher and microwave/convection oven. Andersen and WinDoor windows and doors open to 1,780 sf of covered outdoor living including a dining area, gas fireplace and built in grill overlooking the expansive sun filled pool/spa and generous grassy backyard with outdoor shower. Electric screens and storm shutters included. Additional $50K in upgrades include Cristallo countertop kitchen island, Walker Zanger tile, control 4 automation with Lutron smart lighting. Prewired for sound system in both interior and exterior. This spectacular home is not to be missed. Home is eligible for membership to the private Moorings Beach Club. Moorings Homes: Ideally situated one level Knauf built home offering the absolute best combination of quality, location, and meticulous attention to detail. This residence is an absolute all-star collaborative from developer Crayton Road Development, builder Knauf Koenig, and architect Falcon Design. 5 bedroom home offers just over 4,300 square feet of air conditioned space all on one level and is filled with absolute top end finishes including wide plank wood flooring throughout, Ruffino cabinetry, Sub-Zero/Wolf/Miele appliances, meticulously selected natural stones, Poliform closet systems throughout, and an exceptional outdoor living area complete with kitchen, automated screens/shutters, and fire bowls flanking the pool. Truly an exceptional home in an ideal location south of Mooring Line Drive offering easy access to Old Naples and the optional private Moorings beach access. Moorings Homes: Renowned developer Sea Castle Homes partnered with architect Ashmore Design and designer Carleen Young bring together a distinct home unlike any other. Vintage doors, wood table top salvaged from Edison and Ford Winter Estates and white oak floors and detailing throughout, enhance this curated home just minutes to the beach and Old Naples. Offered furnished, this extraordinary residence features a great room plan that embraces indoor-outdoor flow. The open kitchen with natural elements and mixed metals features two multifunctional islands, and Wolf, Asko and Sub-Zero appliances. Capturing the kitchen’s spirit is a stylish barn door that gives way to a walk-in pantry with designer cabinetry and ice maker. A first-floor master bedroom creates a perfect retreat for quiet space and allows for relaxation with a spa-like bathroom featuring free-standing soaking tub and a hidden laundry. Three additional guest en-suites enjoy privacy and leisure with a second-floor living area and balcony overlooking the pool. On the exterior, multiple covered lanai areas, summer kitchen, fire bowl feature, gas-heated pool and spa with extensive outdoor decking complete this exceptional home. Moorings Homes: LUXURY WEST INDIES STYLE HOME TO BE BUILT BY PROVIDENT BEACH HOUSES...PLEASE DO NOT WALK THIS LOT WITHOUT APPOINTMENT...OFFERS FIVE BEDROOMS WITH FIVE FULL AND TWO HALF BATHROOMS...SPACIOUS CONCRETE BLOCK/MASONRY CONSTRUCTION WITH 6614 SQ FT IN TOTAL WITH 5195 SQ FT UNDER AIR INCLUDING FIRST AND SECOND FLOOR LIVING ROOMS......TWO LEVEL FLOOR PLAN WITH HIGH DECORATIVE CEILINGS... SECOND FLOOR SUITES WITH PRIVATE BALCONIES...1ST AND 2ND FLOOR LAUNDRY...SECOND FLOOR LIVING ROOM WITH BALCONY...ELEGANT APPOINTMENTS THROUGHOUT INCLUDING WIDE EUROPEAN WOOD PLANK FLOORING, MARBLE AND TILE. COVERED LANAI WITH TROPICAL POOL AREA, OUTDOOR KITCHEN AND LIVING AREA...TURNKEY DECORATIVE OPTION AVAILABLE...FINE QUALITY CONSTRUCTION BY PROVIDENT BEACH HOUSES. Moorings Homes: Long, wide water bay views are the focal point of this sprawling one-level home on Venetian Bay. Featuring sought after western exposure, over 100 ft of waterfrontage and an expansive outdoor area with both covered and uncovered spaces, the sunsets here cannot be beat. Copious amounts of glass along the back of the property provide a light and airy feel while providing views from nearly every room. Open kitchen, spacious master suite and high ceilings make this an ideal place to enjoy the Naples waterfront lifestyle. 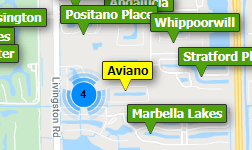 Located just a short stroll from shopping and dining in the Venetian Village. Moorings residents have the ability to join the Moorings Beach park which is only a short bike ride away. Moorings Homes: Make it your own! New Construction in Prestigious Moorings. Buy now to select your own OR choose our designer inspired flooring and Granite, Quartz and Marble surfaces. NEW single story, custom Florida Contemporary open concept situated on a flood exempt lot just blocks to the beach and scheduled for completion Fall 2019. At 4,346 square feet under air, this home has 4 bedrooms plus Study/optional bedroom, 6 baths, and 3 car garage. A fully automated pool with state-of-the-art equipment and lighting, tiled lanai, summer kitchen and gas fire feature, ideal for outdoor entertaining. Exquisite details and architectural features include exposed wood beam ceilings, a folding glass wall, and glass & metal Cathedral entry door. Quality finishes such as all-wood custom cabinetry, top of the line appliances including Sub-Zero Refrigeration & Wine Storage, Wolf Induction & Convection cooking, Miele & Electrolux. Cutting edge technology and automation with Lutron LED lighting, audio/video, and security including a centralized Systems Control Room. Dual Zone air with humidifier and Wi-Fi thermostats, tankless water heaters, Andersen impact-resistant windows, and motorized screens and shutters. Moorings Homes: H.13504 WATERFRONT elegance on stately Spring Line Drive. Located near the western end of a quiet cul de sac, this timeless two-story estate showcases long & private views across Compass Cove. Perfectly situated to take advantage of coastal breezes & water views from nearly every room. Gorgeous outdoor entertaining, w/ infinity pool & spa, & spacious covered lanai where you can relax & enjoy watching dolphins pass by. Private park-like feel with an expansive lawn, mature trees & a picturesque butterfly garden. Inside, the thoughtfully designed floor plan is open & light, perfect for today’s entertaining lifestyle, but also provides separate living spaces & privacy. Main level includes a living room w/fireplace, grand chef’s kitchen with gas cook-top, family room, study, & alluring master suite. Upstairs is a second living area w/large waterfront balcony, & 3 additional bedrooms, all with en-suite baths. Other features include upstairs/downstairs laundry, upstairs bar & multiple storage closets. Best of all, there is a private boat dock & lift w/Gulf access through nearby Doctor’s Pass. Private beach access available at the Moorings Residents Beach Park, a short walk away. Vista Royale Moorings Homes: Significant price reduction! Just steps to the beach! 4 bedrooms,5 baths! Breathtaking views of Venetian Bay! End unit, private elevator, boat dock! This magnificent home is located in the heart of the Moorings. Custom pool area features spa and lush tropical foliage. All the embellishments one would expect in this luxury home. This may be the perfect home to downsize from a mega-mansion and maintain your lifestyle. We will make it easy to show! Moorings Homes: Perfectly placed, in a quiet enclave of the Moorings and only a short stroll to the private Moorings Beach Park, this one level, new construction beauty is sure to impress. Light oak floors, white tongue and groove ceilings and custom shaker cabinetry give a coastal flair. The great room plan which flows perfectly to the expansive outdoor area provides for effortless entertaining. Additional notable features include, Wolf and Sub-Zero appliances, marble and quartzite countertops, screens and shutters for the exterior covered space and exterior fire bowls. Encompassing over 4,000 SqFt with 4 bedrooms and a den and a sprawling back yard area, this is a perfect setting to take advantage of the idyllic Naples lifestyle. Moorings Homes: Sitting on one of Naples’ most enviable streets, 2075 Crayton Road in the exclusive Moorings neighborhood has just been listed. The four-bedroom plus den, six-bath (four full, two half), 4,190 square foot (under air) two-story single family home sits on a spacious interior lot with beautiful southwestern exposure and is just a short walk from the beach.The open-concept home remains like new and comes fully furnished. With a full chef’s kitchen, expansive island, gourmet Wolf and Subzero appliances, crisp all white custom cabinetry, any size party is effortless. The exquisite finishes and highest quality architectural and construction detail make this home ‘one of one.’ Wide-plank wood flooring throughout is complemented with occasional uses of marble and terrazzo, while spectacular overhead fixtures bathe the home in light. Meanwhile, the outdoor living area features a kitchen with island, fireplace and television just off the pool and spa (which also has a sun shelf and water feature). The home also features a large three-car garage and lush landscaping that makes you feel as though you are in a private tropical oasis. Moorings Homes: H.13059 - Newly completed, this home sets a new standard for architectural excellence in Naples. As you enter through the massive mahogany front door, you’re met with a soaring 25-foot ceiling, two elegant chandeliers, and the crisp meandering lines of the staircase as it makes its way to the second level. Expertly arranged by the world renowned Shawn Kronen Design Company, this home’s interior successfully merges warmth and livability with the beauty of a modern design. Just off the great room is a well-appointed master suite with a crystal chandelier, his and hers fitted out closets, a sitting nook, and a master bathroom that includes: a stand-alone bathtub, oversized shower with rain showerhead, his and hers Toto toilets, variable colored cove lighting, and walls that shimmer from the meticulously applied layers of Venetian plaster. Just off the back of the house is an outdoor space equipped with an outdoor living room and fireplace, a Chef’s summer kitchen and dining area, a resort style pool and spa with a sun island, and electric roll down screens and storm shutters. A perfect space for leveraging Naples’ tropical climate into years of enjoyment for your family and friends. Moorings Homes: H.13473 -On a beautiful, quiet, mahogany lined street in the Moorings sits this lovely home built in 2014 by Randall Mitchell of Kurtz Homes. With 6,107 S/F LA, an open floor plan boasts understated elegance w/upscale finishes & thoughtful conveniences for easy Florida living. Wood & travertine flooring, 2 gas fireplaces, 2 wet-bars, huge wine cellar, a dehumidification system, Crestron Home Automation, walk-in commercial refrigerator, luxurious master suite features two walk-in closets. A four car garage for the auto enthusiast, anti-mosquito system for outdoor entertaining comfort, a generator & much more! The gourmet kitchen features granite counter-tops, top-of-the-line appliances, double wall ovens, 6-burner gas cooktop, center island & walk-in pantry. Upstairs, the ultimate gathering place for game day/cards/billiards. Tongue and groove Cypress ceiling, upper level laundry & 2 en-suite guest rooms. Lanai is an entertainer’s dream with built-in summer kitchen, gas fireplace, resort-like pool/spa enveloped by lush landscaping. Just minutes to Moorings Private Beach Park, Venetian Village & right between fabulous 5th Ave shopping to the south & Waterside shops to the north. Moorings Homes: Luxury in Naples’ Prestigious Moorings. This Custom 4 bedroom plus den, 4.5 bath pool home is scheduled for completion May 2019. At 3725 SF, our single story, contemporary open concept is situated on a flood exempt lot just blocks to the beach and includes 3 car garage. Built only to the highest standards with exquisite finishes, details, and convenience for the most discriminating buyer. Every detail carefully considered including noise and energy efficiency with all-wall insulation throughout. Chef’s dream kitchen features custom cabinetry, Sub-Zero Refrigeration & Wine Storage, Wolf Induction & Convection cooking. Convenience, security, and automation with Lutron LED lighting, A/V, security with centralized Systems Control Room. Dual Zone air including de-humidifier and Wi-Fi thermostats, tankless water heaters and motorized roll down screens and shutters. Entertain outdoors around your fully automated pool with state-of-the-art Pentair pool equipment and lighting, tiled lanai and summer kitchen. Architectural features include exposed wood beams, custom built-ins, impact resistant doors and windows, 30 ft folding glass wall, and glass & metal Cathedral entry door. Moorings Homes: Ideally situated one level Southern exposure home located in the prestigious Moorings community. This exquisitely designed home offers the perfect combination of quality, location, and attention to detail. All 5 en-suite bedrooms are perfectly positioned throughout 3,864 Sf of this spacious open floor plan. Offering 10’ wide European white oak flooring, a gracious foyer and great room that flow into the chefs kitchen, dinning, and outdoor living area with ease. Built in wet bar, butlers pantry, and wine storage paired with an amazing outdoor space equipped with a summer kitchen, gas fireplace, and roll down screens and shutters make this home perfect for entertaining or relaxing with the family. A spacious master bedroom and bathroom, Anderson impact windows and doors, control 4 home automation system, salt water pool and spa, and mature landscape completes this truly remarkable retreat. All of these extraordinary finishes paired with the most ideal location West of Crayton road which offers easy access to the Moorings private beach access makes this home an absolute rare find. Moorings Homes: The impeccably designed home by Weber Design Inc. and built by 2018 Sand Dollar Award Winner Big Island Builders Inc, offers four spacious bedrooms and den, including a generous master suite with walk-in closets and en-suite bath with tub and multi head shower. Owners will also enjoy an open floor plan great room, well-appointed gourmet kitchen, guest rooms all en-suite. Experience the resort-style outdoor space with pool and spa and built-in kitchen and fireplace, allowing hours of effortless entertaining. The office overlooks the salt water heated large pool and spa. Located close to the beach, north of Old Naples and south of Venetian Village for upscale dining, shopping and entertainment, residents are also eligible for use of the private Moorings Beach Park. It is also Home Automation Ready and Elevator Ready. Electric car charging station already installed inside your ample 3 car garage flanked by beautiful bougainvilleas. Moorings Homes: Open House Sunday 1-4 pm.Stunning new construction with preferred southern exposure, estate home offers 4 Beds plus study, nearly 4,400 SF of air conditioned space, and is situated on a peaceful street within walking distance to the Moorings Private Beach.This coastal inspired West Indies styled residence is a collaborative of highly regarded professionals, builder Big Island Builders, architect Greg Weber, and Sandal Holdings as developer. The home is exceptionally bright throughout and offers an ideal layout perfect for entertaining including seamless indoor to outdoor integration. Some of the additional stand out features include, a gourmet kitchen with Wolf & Sub Zero appliances and large pantry, first floor amazing master suite, custom cabinetry, perfectly executed custom millwork and ceiling details, low voltage lighting system, second floor oversized 3 en suite bedrooms including second master VIP suite, concrete construction, and flawless outdoor living complete with automated roll down screens and shutters.Lot is 0.43 Acres and is located in the X zone –no flood insurance required.This remarkable home without a doubt is the best opportunity for new construction West of 41. Moorings Homes: H.14344 -With a classic coastal aesthetic and luxurious modern finishes, this home perfectly captures spirit of the Naples experience. Designed by the world-renowned John Cooney of Stofft Cooney Architects, this spacious single level floorplan is an ideal setting for warm winter getaways or year round living. The highly coveted eastern exposure fills this home with light in the morning and leaves the expansive outdoor living space and summer kitchen comfortably shaded in the afternoons. The home’s interior is highlighted by: a gourmet chef’s kitchen with Wolf Sub-Zero appliances and a double island, an expansive open concept great room, Control-4 automation and lighting system, DuChateau oak floors throughout, a 500 bottle wine room, 4 guest suites, and a generous master suite with his and hers bathrooms. Large sliders and charming French doors open to the equally well appointed outdoor space which includes: a gas fireplace, Sentinel electric screens and shutters, and a Cypress wood ceiling. Centrally located on one of the area’s most distinguished streets; Venetian Village, Downtown Naples, and the Moorings private beach park are all moments away. PHOTOS AND VIDEO COMING SOON! Moorings Homes: H.13753 HUGE PRICE REDUCTION AND PRICED TO SELL! You must see this custom-designed, California Mission-inspired home in person to fully experience the incredibly lush, huge outdoor living area and back yard, wide open floor plan & luxury amenities. On.40 acre lot w/Southern exposure, this family home features rich, 8-in, European hardwood flooring throughout living areas which flow generously onto a grand lanai with outdoor kitchen/bar and saltwater pool/spa/fountains/sun deck for entertaining ease & glamour. Gourmet kitchen features Wolfe and SubZero appliances, oversized island, white granite countertops, white cabinetry, Carrera marble backsplash, warming drawer & many other high-end features. Huge spa-like master suite features bath w Carrera marble, separate vanities, glass cabinets, soaking tub & dual-entry showers w multiple shower heads. Dual oversized walk-in closets feature overhead shelves for ample AC storage. Second master BR, also first floor, features sitting area & luxury bath. Two other ensuite guest rooms are 1st floor & one upstairs can be bonus room, game room, media room. Elevator ready. Surrounded by green space on non-cut-through street. Moorings Beach Club. Moorings Homes: An extraordinary open single story 5 bedroom home in the heart of The Moorings with a spectacular pool and outdoor entertainment areas. Vaulted ceilings, a dream kitchen (Sub Zero/Wolf appliances), 3 car garage, and a golf course quality lawn are just some of the features in this comfortable newly constructed home that makes enjoying the best of the Naples lifestyle easy. Moorings Homes: This remarkable new construction home welcomes you with breathtaking views of the golf course Private Moorings C.C. featuring 4 Bedrooms, Study, 4 ½ Baths and 3 Car garage just under 4,100 SF of air-conditioned space all on one level. This Estate Home is filled with absolute top end finishes including wide plank wood flooring throughout, Custom cabinetry, Sub-Zero/Wolf/Miele appliances, retractable screens and shutters and an unparalleled combination of attributes including solid concrete construction, energy efficient materials, natural stones and woods. Addressing every possible need of the most sophisticated buyers, this property offers a Gourmet kitchen with professional grade burner gas range, large center island, and oversized pantry. Generous pocket sliding doors open to the gracious outdoor area with panoramic views showcasing an amazing pool and spa, outdoor kitchen, dining and lounging areas, affording the ideal retreat and entertainment area. This Naples residence is centrally located just moments away from world-class upscale shopping and dining at Waterside Shops and Venetian Village as well as sandy beaches at the private Moorings Beach access. Moorings Homes: Elegance and space to spare. 5 bedrooms and 8 baths, 2 offices, walk in closets to die for! This two year old home is being sold fully furnished. No expense spared on the building of this home in the Moorings, one of the most sought after areas in all of Naples with private beach access and parking less than 1 mile away. 7.1/5.1 surround sound throughout the entire home. 161" 4K HD projector w/7.1 surround in the theater room along with a fully appointed bar and huge deck outside overlooking the 40 ft. endless pool. Security cameras, fenced yard and electric gate protect you and your new home. This home also boasts an ELEVATOR! Oversized three car garage. Dual 70" commercial grade refrigerator/freezers in this beautiful eat in chefs kitchen with exquisite granite throughout. Outdoor kitchen area and the list goes on and on! THERE IS NOT A BETTER VALUE ANYWHERE IN NAPLES, FL !!!! Moorings Homes: H.13590 Magnificent southern facing custom estate home offers exquisite custom wood craftsmanship and designer details throughout. The open floorplan flows seamlessly beneath soaring ceilings on the first floor, formal living room with fireplace, eat-in gourmet kitchen, formal dining room, family room; master suite, two guest bedrooms, den. Second master suite and huge recreation room on second level. Golf course views off the spacious covered lanai add to the special ambiance of this home and feature cedar ceiling, pool, spa, outdoor kitchen and fireplace; perfect for all day and evening entertaining! Lush landscaping compliments the luxurious tropical feel of this beautiful home; 3-car garage with circular driveway provides plenty of parking for owners and guests. Close to the private Moorings Beach Park; minutes from Old Naples, this south facing home is flooded with natural light. Beautifully furnished; furnishings negotiable. Full-house generator; 500 gallon buried propane tank. Original owners have meticulously maintained this home in mint condition. Come see this beautiful, unique home where you will live the Naples lifestyle you seek. Need professional assistance selling your property at Moorings Naples? Find out how an Area Specialist can help to generate more property exposure in order to get the most money for your investment in the least amount of time.